TOKYO: North Korea's military conducted huge live-fire drills Tuesday and issued new warnings that it would defend itself against the "American imperialists," amid high tensions and a military buildup in the region. But the United States and its South Korean and Japanese allies showed their muscle as well by conducting military exercises of their own. In addition, one of the U.S.'s largest guided-missile submarines showed up in the South Korean port of Busan, presaging of the imminent arrival to the region of a naval strike group led by an aircraft carrier. The military build-up on both sides comes amid heightened tensions over North Korea's nuclear and missile programs, and warnings from the Trump administration that "all options are on the table" for dealing with the regime in Pyongyang. Kim Jong Un's regime marked the 85th anniversary of the founding of North Korea's army Tuesday with its typical bluster. "If the enemies dare opt for the military adventure despite our repeated warnings, our armed forces will wipe the strongholds of aggression off the surface of the earth through powerful preemptive nuclear attacks," Defense Minister Pak Yong Sik said in a speech before a hall filled with the country's top brass and broadcast on state television. Analysts had been concerned that North Korea might seek to mark important dates this month - the birthday of the state's founder was celebrated with a huge military parade on April 15 - with a nuclear or ballistic missile test. North Korea did launch a missile on April 16, but it exploded within seconds. But on the latest anniversary Tuesday, the North instead conducted large-scale live-fire drills near Wonsan on its east coast, South Korea's joint chiefs of staff said. The South's Yonhap news agency reported that the exercises were North Korea's largest ever, involving some 300 or 400 pieces of artillery, but the joint chiefs did not confirm the number. Analysts warned against reading too much into the exercises with conventional weaponry, noting that North Korea's annual winter training cycle culminates in big exercise every year around this time. Still, North Korea remains defiant despite mounting pressure from the Trump administration and, increasingly, China, to stop its missile program. "China has a very, very important role to play" to convince North Korea to give up its nuclear ambition, Joseph Yun, the U.S. special representative for North Korea policy, told reporters in Tokyo. Yun met with his South Korean and Japanese counterparts in Tokyo Tuesday, and China's main point man on North Korea was also in town, in a sign that diplomacy is not entirely dead. "We agreed that we will strongly warn that North Korea should stop further strategic provocations," said Kim Hong-kyun, South Korea's representative. "But we will take strong punitive action that the North could not bear if it pushes ahead with one despite the warning." The United Nations Security Council will hold special ministerial meeting Friday to discuss further sanctions on the regime in Pyongyang, but first, Trump has called all 100 senators to the White House Wednesday for a briefing on North Korea. But with increasingly provocative statements and actions coming from North Korea, the emphasis is on military deterrence. The U.S. Navy destroyer, the USS Wayne E. Meyer, began maritime exercises with a South Korean destroyer in the Yellow Sea, west of the Korean Peninsula, Tuesday. Separately, the USS Fitzgerald was doing drills with a Japanese destroyer in the Sea of Japan, east of the Korean Peninsula. Both will continue Wednesday. "Both exercises demonstrate a shared commitment to security and stability in Northeast Asia," the U.S. Seventh Fleet said in a statement, "as well as the U.S. Navy's inherent flexibility to combine with allied naval forces in response to a broad range of situations." 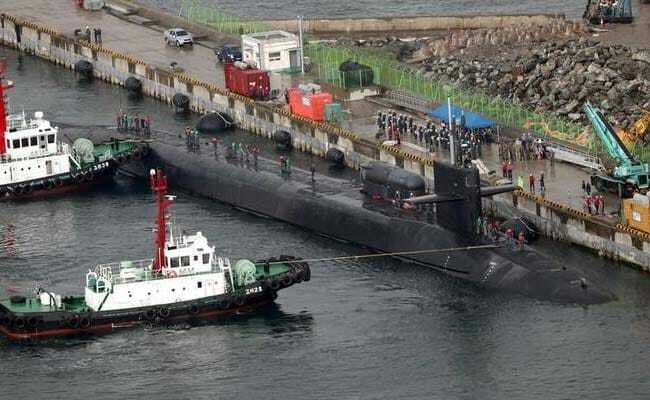 Earlier, the U.S. Navy announced that the USS Michigan, an Ohio-class guided missile submarine, had arrived in the southern South Korean port of Busan "for a regularly scheduled port visit." The USS Carl Vinson aircraft carrier, together with two guided-missile destroyers and a cruiser, are expected to arrive in the waters off the Korean Peninsula in the next few days and stage a combined tactical operation with the South Korean Navy. The strike group has been the focus of some controversy in recent weeks, after the Navy announced earlier this month it was being re-routed from Singapore to the "western Pacific" as a "prudent" measure amid expected North Korean provocations. President Donald Trump said he was sending an "armada" to North Korea and other senior officials also strongly implied that the strike group was heading to the Korean Peninsula area. It later transpired that the group had in fact headed in the opposite direction, to the Indian Ocean, causing consternation in South Korea in particular. This time, the Navy has been publicizing the strike group's progress towards the region, posting photos over the weekend of its exercises with the Japanese military in the Philippine Sea.